I really like the daily maps that Google makes of my whereabouts. It’s called my Timeline and it’s all done automatically as long as I have location services turned on. 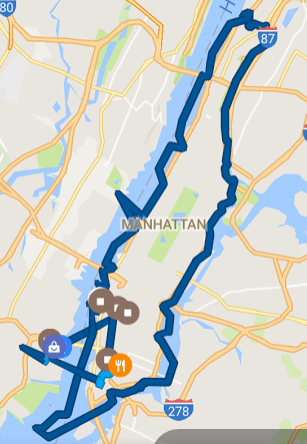 A few days ago, we took a cruise around Manhattan, and I think the timeline map will add a lot to my story. Don’t you agree? Any map (or anything at all!) that you can see on your phone, or on your computer, can be captured as an image. Then it can be used in your Blog, just like any other picture. F Instructions above use techniques built in to the computer’s operating system. To get more functionality with your screen captures, we recommend Snagit. Example: here’s a blog post of mine using a computer screen capture of Google Maps in Satellite view. Click on the image below to go to the Blog post and see the whole thing, including 2 maps. Published by MrsGeek, in Blog. Tagged with Adding maps to blog posts, Blogger, Blogs, Google Maps, how to take screenshots, Screen Prints, smartphone cameras, Smartphones.